Yasser Al Asmi, 18, smiles with his younger brother at his graduation from Moncton High School. Yasser Al Asmi always has a smile on his face. Not because his life is perfect or because his pain is healed, but because he is alive — and safe. 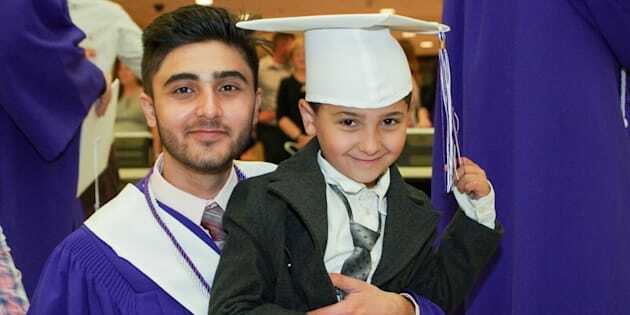 After escaping the war in Syria with his family two years ago, the Moncton High School grad went from seeing gunshots on his porch to scoring a special Canada Day invite from the minister of Canadian Heritage. The 18-year-old was recently awarded the renowned Roméo LeBlanc scholarship to the University of Moncton, where he'll study in French as a pre-med student starting this fall. The scholarship, which covers his full tuition, is given to the student with the highest grades from an anglophone high school in Atlantic Canada. But it's the community in his new New Brunswick home that he credits with helping him gain the confidence to push himself further. "Everybody in Moncton is your friend," Al Asmi told HuffPost Canada. "These are the people that helped me recover from what I saw back home." In Syria, Al Asmi came straight home after school, and didn't leave. "It was living in constant fear all the time. Every day." Yasser Al Asmi receiving the Roméo LeBlanc scholarship from the mayor of Moncton, Dawn Arnold, during his graduation ceremony. On a February night in 2016, Al Asmi, his parents and his three younger siblings arrived in Montreal and then moved to Moncton two days later through the Liberal government's resettlement program. Launched in 2015 to settle more than 40,000 Syrian refugees in Canada, the current impact of the massive undertaking is attracting some flak from Saskatchewan's immigration minister and the federal auditor general. Al Asmi threw himself into his studies in Canada. He advanced from Grade 10 science to Grade 11 chemistry in the first month of school and taught himself French along the way. By watching popular French YouTubers like Cyprien and using Duolingo, Al Asmi picked up the language in his spare time. He says one of his dreams is to be a polyglot. "I could not accept being in a situation where people would be speaking the national language and I would not understand it," he said. "I felt like I had to do that. I had to do it as a new Canadian." Learning a national language shouldn't even be a political debate: "It's cultural capital." Ginette Petitpas Taylor, Canada's minister of health, appeared to agree, sharing her enthusiasm for Al Asmi's achievement on Twitter when his scholarship was announced. Two years ago, Yasser Al Asmi arrived in Moncton not speaking a word of French. This fall, he'll start at a French university on a full scholarship. For Al Asmi, Canada already feels like much more of a home than Jordan, where his family initially fled to while escaping violence in Syria. "Canadian winter is nothing like we imagined," he recalls. But he soon learned that if there's one thing more Canadian than snow, it's complaining about the snow. After school, his neighbours would help him shovel the driveway so he'd have enough time to finish his homework. Yasser Al Asmi at the beach in Shediac, N.B. "Our neighbours are really an extension of my family," he said, crediting them for his love for lobster, which they frequently bring over in exchange for falafels. During their first summer in Moncton, Al Asmi's family spent many afternoons by the beach in Shediac, N.B., dubbed the "Lobster Capital of the World." The town takes its title seriously — recently reclaiming the record for the world's longest lobster roll. The aspiring doctor can't wait to start university. While he's always dreamed of becoming a cardiologist, he plans on giving himself some time to learn everything from history to world religions, too. He's thankful for his supportive parents, who have kept his spirits up while he adjusted to school in Canada. "Family is everything " he says. "I just want them to see me succeed."